Muddle peeled and chopped kiwi and simple syrup in a shaker. Shake hard with remaining ingredietns and strain over crushed ice. 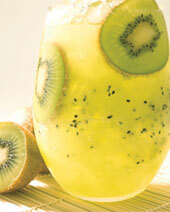 Garnish with kiwi slices.